Several times per week in our house we like to have what we call, “family time.” This is when we shut off all computers and TV. We silence and put away our mobile phones and gather around the kitchen table for some fun and games. We have a bunch of board games that we can choose from or we may just take out some paper and pencils and draw. We particularly enjoy games where we must act out scenes, do charades, or do other silly things. Like when one teammate sees a word and must get the other team member to guess that word using body language, or verbal clues. 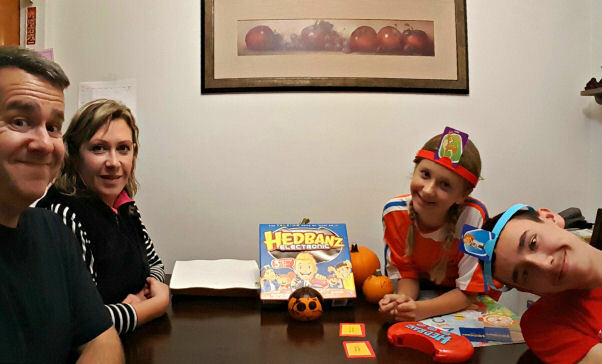 One game that we have recently become addicted to is Hedbanz ™ Electronic. This is the electronic version of original Hedbanz™. For those of you not familiar with the game you break up into teams and your partner puts a card on top of their head. They cannot see this card but they will know the theme. The themes could be JOBS, ANIMALS and THINGS. Once you have the card fixed into the Hedbanz™ holder you press the button on the electronic device that is included. The device not only prompts you with instructions but it keeps time and records the score between the two teams. and Act it out (the teammate acts out the word without using words. For example, say the category was animals and the word was “dog.” If the Hedbanz™ Electronic device said “act it out”, the teammate without the card on their head would have to act out being a dog. The person would then have a chance to make guesses based on what is being acted out. If they answer it correctly, then they press the button on the Hedbanz™ device and play passes on to the other team. If the team answers quick enough, then they receive a speed bonus. After two teammates get a chance of guessing the Hedbanz™ device provides the score. The partners switch places so the one guessing then becomes the clue giver. Play continues until three more words are guessed and then the final score is provided. 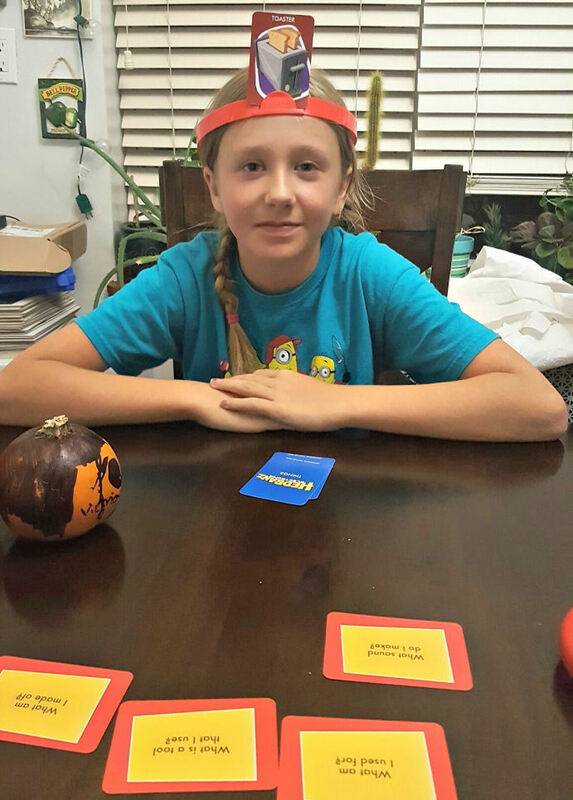 Hedbanz™ Electronic is fast paced, exciting, and leads to some great hilarious family fun. We have four people in our family so we play three different rounds so everyone gets a chance to team up with each family member. At first it took a little bit of time for us to get used to the “ask it” portion of the game. You must challenge yourself to come up with good “yes or no” questions to guess the word correctly. We had some difficulty with that until we started using the included question prompt cards. If you use those questions, then you are not limited to “yes or no” questions. For example, say the word was toothbrush you could ask, “what am I used for?” The teammate could then simply answer “cleaning the white things in your mouth.” They couldn’t use the phrase “brushing your teeth”, because the word brush and teeth is part of the answer. It takes some practice and creativity to come up with clues but after a while you get used to it. Check out the quick video below of my daughter demonstrating the Hedbanz™ Electronic game with her friend and showing our new puppy! Overall we enjoyed playing Hedbanz™ Electronic and are a looking forward to many more hours of enjoyment during our family nights. It’s a fun, family must have game and a great gift idea! You can purchase Hedbanz™ Electronic on Amazon. What board games are your family favorites? « How to Teach Cooperative Play and Have Fun: Hoot Owl Hoot! We have the new Headbanz Electronic game and we love it too. So fun! This game looks so fun! I think my kids would love this.